For those of us who, like me, are born and raised in Tuscany, we have had countless opportunities to get to know and appreciate the characteristics that have made this region the most beautiful in Italy and one of the most famous and well-known areas in the world. Tuscany is beautiful to see, to photograph and to remember: interesting to know and to discover with incredible and different landscapes in every season. Wherever you go in the smallest village or in the old ruined farmhouse, in the great museums of Florence, Arezzo and Siena or in the small and delightful ones of Lucignano and Monterchi, you will be surrounded by a thousand sensations of beauty and perfection and you will find countless traces of the inimitable art that had its cradle here, between 1400 and 1500. The Tuscan civilization is the sense of measure and balance of proportions: nothing less but nothing more, it is the key to the Renaissance, but it is also the key to its cuisine that Tuscans people call “poor”. Poor because of the lack of sauces and complicated cooking and rich in simple flavors, authentically Mediterranean, which mixes meat cooked on the embers with the abundance of cereals, vegetables, herbs and extra virgin olive oil. A special mention for the wine, be it Chianti, Brunello di Montalcino or Nobile di Montepulciano, each has its own inimitable aroma, and while you toast admiring the wonderful hilly landscape, the transparent sky and the long avenues of cypress trees, you know that you will always carry with you the memory of these moments so simple but at the same time unique. 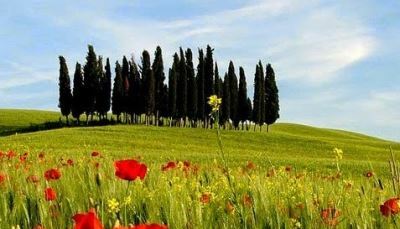 For those who already know Tuscany no more words are needed, you just have to close your eyes in silence to see the beautiful landscapes and rethink the happy moments of your holidays. For those who don't know it yet, they would take a thousand pages to explain that here in Tuscany the sun is still the sun, that time passes slowly, that nature, with its ancient landscapes, is made of a few pure colors, such as: the ochre of the soil, the silver of the olive trees, the green of the vineyards and woods... I don't want to tell you more, but I want to invite you to discover all that Tuscany has to offer.